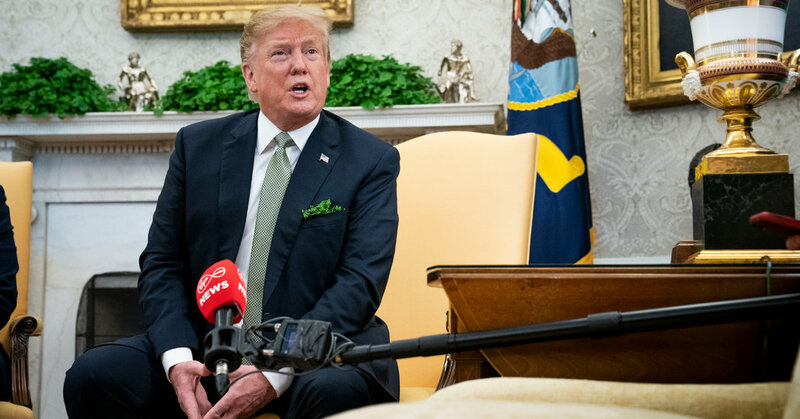 WASHINGTON — Tucked between St. Patrick’s Day greetings and repeat criticism of a rerun of “Saturday Night Live,” President Trump demonstrated that not even death provides a respite from his wrath on Twitter. In Twitter posts on Saturday and Sunday, Mr. Trump renewed his criticism of Senator John McCain, the Arizona Republican who died in August from complications from a virulent form of brain cancer. The president attacked Mr. McCain over his role in the Justice Department investigation into Russian efforts to influence the 2016 presidential election. He then added that Mr. McCain “had far worse ‘stains’” on his record, including the senator’s decisive vote against repealing the Affordable Care Act. The comments exemplified Mr. Trump’s new model for presidential communication, both in form and tone, exploiting the power and urgency of social media. But they also sparked swift condemnation, showing that the president abandons conventional boundaries of civility like not speaking ill of the dead at his peril. Mr. Trump and Mr. McCain had a long history of enmity. Mr. McCain provided a copy of the so-called Steele Dossier — which outlined a range of often salacious but unproven misdeeds by Mr. Trump and his associates — to the F.B.I. after Election Day. Supporters of Mr. Trump have seized on the dossier as a way to try to discredit the Russia inquiry. The battle lasted even through the senator’s death. Mr. McCain made it clear that Mr. Trump was not welcome at his memorial service, even as both President Barack Obama, who defeated Mr. McCain in the 2008 presidential race, and President George W. Bush, who defeated him in the Republican primaries in 2000, delivered eulogies. And over the weekend, the tensions surfaced again, as McCain supporters denounced the president’s tweets — and, in many cases, the president himself. Mr. Weaver criticized Mr. Trump’s avoidance of service in Vietnam, where Mr. McCain was held captive as a prisoner of war, his refusal to release his own grades while criticizing Mr. McCain’s academic performance at the United States Naval Academy, and the president’s desire to terminate the Affordable Care Act. “These are the things he wanted to attack John McCain on? Seriously?” Mr. Weaver said. Mark Salter, one of Mr. McCain’s closest advisers and co-author of several books with him, was even more biting.